These Strawberry Banana Muffins were a last-minute addition to my Mother’s Day Brunch line-up. They were so last minute that I had my husband run to the store to pick up more strawberries about an hour before our company was due to arrive! I spotted this recipe on Just2Good and followed it to a tee. Due to a limited produce selection, I ended up using frozen strawberries. Due to overzealous muffin-tin filling, I ended up with only 14 muffins instead of the suggested 18. I needed to bake them a bit longer, but they turned out beautifully! It’s worth noting that the muffin tops don’t brown when they are done, but they will spring back when lightly pressed. 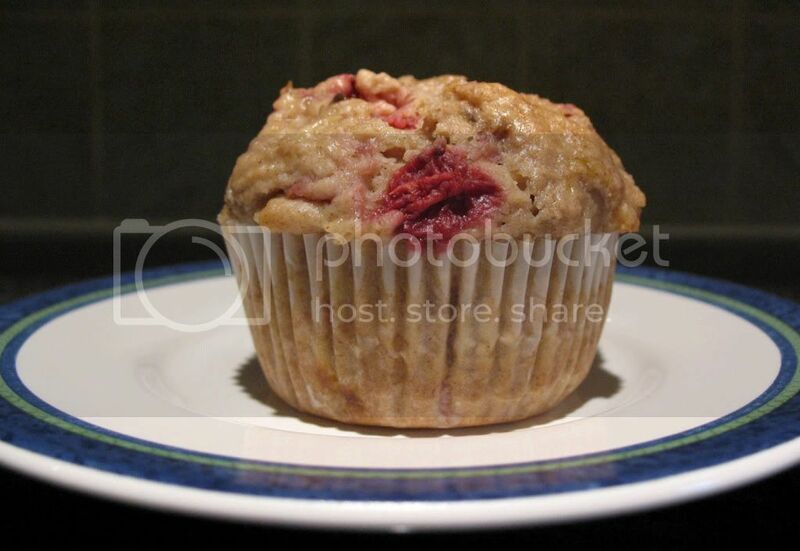 The strawberry banana combination is delicious – something I had never thought to put in a muffin. The bananas lend a subtle sweetness and great moist consistancy to the muffin, while the strawberries provide bright bursts of flavor. 1. Preheat oven to 350 degrees. Line muffin pan with 18 paper liners. 2. In a large bowl combine the flour, baking soda, baking powder, salt, and cinnamon. 3. After mixing, gently fold in the strawberries, making sure to coat them with flour. 4. In another bowl, combine the brown sugar, eggs, butter, bananas, and vanilla until mixed thoroughly. 5. Slowly combine the wet mixture with the dry mixture and stir until just combined. Overmixing will result in tough, dense muffins. 6. Divide batter evenly among the 18 muffin cups. 7. Bake for 22-25 minutes or until a toothpick inserted in the center of a muffin comes out clean. 8. Transfer to a wire rack to cool. They look wonderful! Glad you enjoyed them.